Cardinal Reinhard Marx, head of the German Bishop’s Conference and among the nine closest advisers to Pope Francis, applauded the teachings of Communist Karl Marx, whose 200th birthday occurs on May 5, claiming that the Communist Manifesto “impressed” him, helped to shape Catholic social doctrine, and was in no way responsible for the Communist atrocities and class-genocide committed by Marx’s followers over the last 100-plus years. Screenshot of Frankfurter Allgemeine Sonntagzszeitung, May 1, 2018. The German cardinal criticized capitalism, claiming there are “enormous social inequalities and ecological damage that capitalist dynamics are answerable to,” and adding that any improvements are “not an achievement of capitalism but the result of a struggle against these excesses.” Communist China and the predominantly socialist India are two of the most polluted countries in the world, according to the World Health Organization; the United States and Western Europe are among the least polluted nations in the world. However, no matter what name you choose to embrace; socialism, fascism, Marxism, or Communism, it is a system that has been oppressive to the masses. It has been proclaimed by the Progressive Democrats as a fair type of government that brings equality and peace, but is that the true story? Does it explain the fact that the USSR slaughtered more than 20 million souls, China murdered 65 million, Vietnam more than 1 million, North Korea more than 2 million,Cambodia more than 2 million, 1 million in Eastern Europe, almost 2 million in Africa, 1 1/2 million in Afghanistan, and over 150.000 in Latin America. Does it explain that communist nations have to set up borders not to keep out illegals like President Trump proposes, but instead communist nations build walls to keep their own people in? Does it explain why communist nations silence the majorities and empower the minority Elitist Political Class? For these reasons, we should be grateful for the wisdom of our Founding Fathers. We should be grateful for our separation of powers, the electoral college (which gives power to the smaller states), two-party system (which prevents any one group from amassing too much power), the Constitution of the United States (which secures our physical rights, religious rights, rights to free speech, and so much more), and President Trump. After all, President Trump has become one of the most important and meaningful Presidents in American history. He has been, and continues to be, returning our country to its founding roots. Also, he is fighting against the communist movement that the Elitists swamp is fighting so hard to implement in America and throughout the world. Now, Pope Francis appears to be promoting Marxism, as he blames mass migration, and the poverty and desperation that is taking place in Socialist nations around the globe, as the responsibility of Capitalist nations! 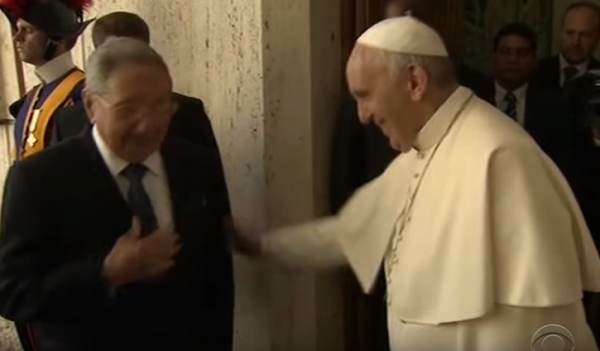 Therefore, as Pope Francis reversed course with decades of anti-communist policies at the Vatican, he attacked the West, and its capitalist system for the woes of the world, despite Socialism and Marxism being responsible for the mass genocide of countless millions of human beings! Pope blamed capitalism and greed for the massive flood of migrants in the United States, and throughout the western world! He especially took pride in slamming the United States of America, and blaming her for all the millions of third world neighbors, for the massive influx of migrants from Socialist nations, rather than the free jobs, free food, free housing, and free medical care, in comparison to their Socialist nation, which everything is either rationed or unavailable! Francis laid the blame for poverty and war at the feet of capitalism, saying it provokes the situations that cause migrants to flee their home countries. He said nothing, however, concerning the destructive influence of socialism that has created social, political and economic crises in South American countries like Venezuela. In the end, Pope Pius XI is right, as it doesn’t matter if you want to call them! You may call them Progressive’s, Marxists, Fabians, Socialists, or Communists, but they are all cut from the same cloth. They all fight for the same goals. They all are fighting to implement a Socialist State with “Atheistic Communism,” as Pope Pius XI said, and as the foundation for their global Marxist directive! The problem with Christianity and Marxist or Communist philosophy combined, are that the two are diametrically opposed to one another. For example, under communism, Christianity is strictly forbidden. But instead, it is replaced with the worship of a secularistic and materialistic government. Karl Marx, the founder of communism, based the radical Marxist ideology’s entire philosophy on dialectical materialism, and even Marx himself believed that the worldly system was driven by materialistic economic forces. In contrast, true Christianity opposes materialism and looks to the spiritual forces and God, which are free from worldly sin. Even in Russia today (the former communist Soviet Union), the government campaigns against God, against religion, and against even the belief in God. It has been that way since the Russian Revolution of 1917 when a communist shroud blanketed the Eastern world with darkness. Also, under communism, there is no divine government or an absolute moral order. That is one of the reasons that under both Fascist based Socialism, and Communist based Socialism, they both brought about some of the largest exterminations of human lives in China, Russia, Nazi Germany, Fascist Italy, and the Empire of Japan. After all, for Marxist Communism, Marxist Socialism, Fascist Socialism, and Progressivism… the end justifies the means. Interestingly, on the flip side of Christianity and Judaism, the end justifying the means, goes against their Christian and Jewish faith, because that communist philosophy puts the law into the hands of human beings, and makes the law subjective. Most men and women are geniuses when it comes to being able to justify any behavior, whether good or bad. We can rationalize any action if the motivation for the goal is strong enough. That is exactly why the ends cannot justify the means, because it is a recipe for complete chaos and the ultimate in evil! Its logical outcome is that each person, or group of people, decides what is moral or immoral, based on that particular situation. Christians believe in quite the opposite, where a set of morals and principles are agreed upon by everyone. It is called Gods laws, the 10 commandments, and in the United States, those commandments are intertwined within the Constitution of the United States, and all the laws contained within. Therefore, under the Christian faith, this is how healthy societies operate, which is by setting rules that everyone must follow, and then punishing the offenders. The greater the crime, the greater the punishment. In fact, that is one of the reasons our Founding Fathers based America on a Constitution, and laws therein on biblical scriptures. Laws to be followed, punishable by incarceration, community service, and even death, depending on the severity of the crime. Previously, communist regimes grew to a point, but they could not sustain themselves. Christianity always took root, and always made it difficult for the Elitists to control the people. Therefore, today’s communists, socialists, and progressives have smartened up. In modern times, they have slowly perverted the churches, in such a way as to make Americans look at the Christian faith and its laws, as more of a set of guidelines, rather than laws. More like flexible rules, than laws with consequences, with the punishment based on the severity of the offense. In what should be obvious to ‘We the People’, the now Marxist Democrats and their Mainstream Media allies have hidden and misconstrued the truth. In reality, The Communist Manifesto, which was published in 1847 by Karl Marx and Frederich Engels, emphasizes how the Elite Political and Social classes have exploited the lower classes. They promoted communism in society as a classless society that eliminates racial prejudice. They portrayed communism as a way to transcend the superficiality of race, skin color, blood, gender, and so forth. However, under both Communist and Fascist based Socialism, it was the largest genocidal ideology or cult in the history of mankind. It sought out people based on skin color, and bloodline, and systematically exterminated tens of millions of human beings, especially Jews and Christians! In contrast, Christians always work to protest against the unfair treatment of the poor, the sick, and those in need. However, in more recent years, many Christians have allowed greed to blur the meaning of life. They have allowed idols to distract them from God. They have allowed their busy lives to view the Sabbath as an option, rather than a requirement. They have allowed peer influence to corrupt their minds, and their worldly surroundings to corrupt their soul. Today, Christianity has become the minority in the world, as the worldly sins permeate our nation, our homes, and yes, even our places of worship. Never-the-less, as the world, the US Government, and even the Pope himself, seem to be in a downward spiral into chaos, it seems only appropriate to question why they can embrace the Marxist ideology, which has a long and bloody history of hate, anti-Semitism, racism, discrimination, and vicious intolerance, brought down on all who not only dare oppose or question their beliefs, but those who refuse to subscribe to their radical ideology! Why does the Pope and the radical left embrace Marxist Socialism when the ideology strategically discriminates and strips the rights and freedoms of the very people of whom they claim to be fighting for? Sadly, the answer is much more simple than most want to believe and can be summed up with just a few short words…POWER AND GREED!